Sometimes companies use one long document that can answer many questions, like a handbook or a sales playbook. Unfortunately, linking to a 100 page document doesn't help users access information they need, quickly. 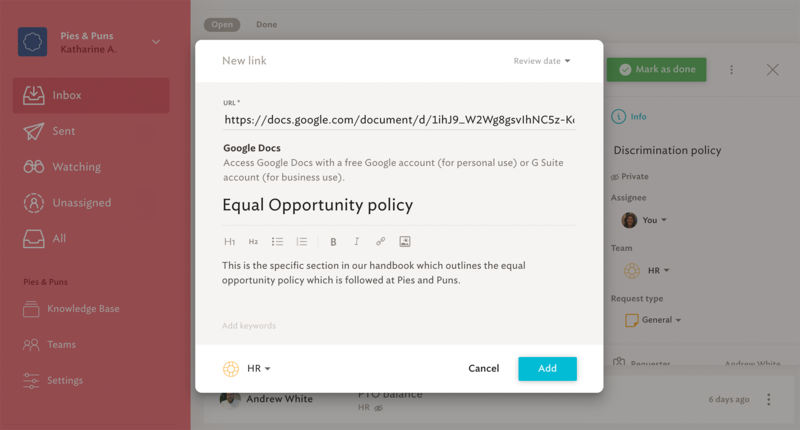 Create bookmarks to make Google Drive documents more digestible. Using bookmarks, you can create knowledge base resources that link to specific pieces of text in the document, to help users find the information they need more quickly. In Google Docs, you'll first need to create a bookmark on the paragraph you want to share. Open the document and select the paragraph which you'd like to link. Select "Insert" from the top menu in Google Docs, then select "Bookmark." You'll see a bookmark ribbon at the beginning of the paragraph, with links next to it for "Link" and "Remove." Right-click "Link" to copy the link to your clipboard. Or click "Link" to open it, then copy it from your browser's address bar. Once you have copied this link, you can navigate back to Spoke, and create a "Link" type knowledge base resource using this bookmark. Begin by selecting the "+" icon, then choose "Link"
Paste in the bookmark link you created above, then enter a title and a description. The knowledge resource will link to the specific text you've bookmarked. 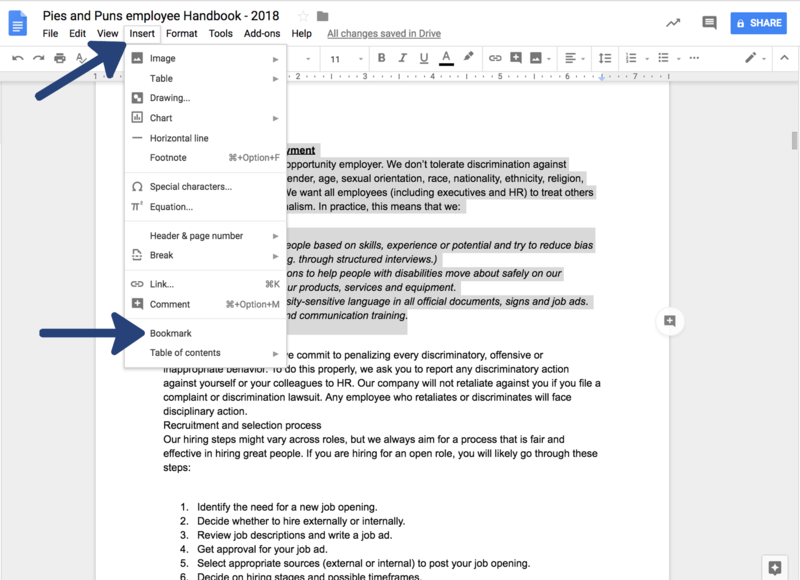 So if you've bookmarked the equal opportunity employment section, you can now train Spoke to answer questions using that specific section of the document, rather than the beginning of the document. Begin by opening your presentation and navigate to the slide you want to use. Copy the URL from your browser's address bar. 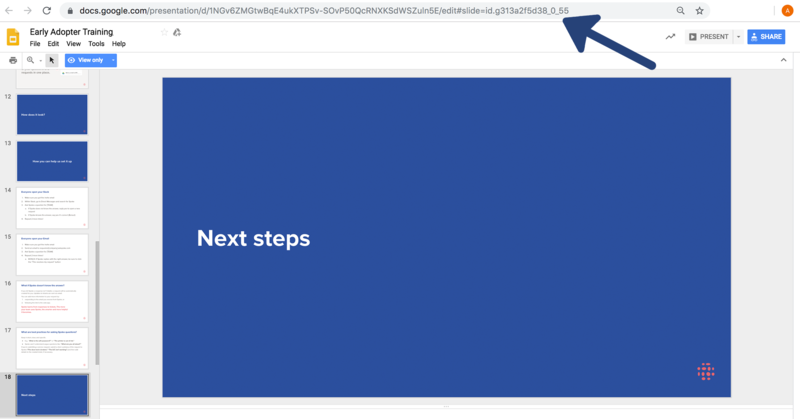 Each slide in a slideshow has its own unique URL which can be linked to. Use this link to create a "Link" type knowledge base resource in Spoke. Add a title, description, and keywords. This knowledge base resource will now link to the specific slide which you've chosen.